Following on from my previous post last month concerning the objects donated connected with Bedford Volunteer Fire Brigade we have received some supporting documents to Mr Mead’s collection. 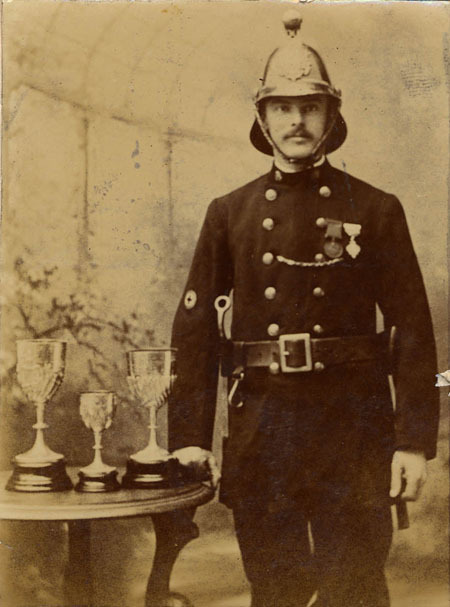 Mr Mead was an active member of the Bedford Volunteer Fire Brigade between 1892 and 1930. 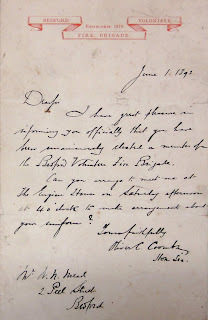 The letters include his “election” as a member in June 1892, as well as his first Rule book for the brigade. I have great pleasure in informing you officially that you have been unanimously elected a member for the Bedford Volunteer Fire Brigade. Can you arrange to meet me at the Engine House on Saturday Afternoon at 4 O’Clock to make arrangements about your uniform. ﻿﻿﻿﻿﻿﻿ Walter summarises his career in a letter written to Mr Keech on June 14th 1949. For reference to your enquiry Re: Bedford Fire Brigade. I was elected June 1st 1892. My Service as an Active Member over the age of 55 years as per Brigade Rule was extended until Feb 12th 1930 with their appreciation of my services; also I was informed by the Management Committee I was appointed Honorary Member of the Bedford Fire Brigade for Valuable Services extending over 35 years, 7th of June 1930. Was Liason Officer during the 1939-1945 war at the Control Room for the Borough Brigade. I have the National Fire Brigade’s Union Silver Medal for 20 years (Reg no. 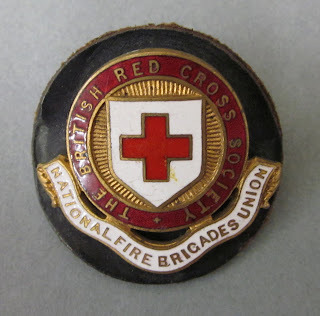 936) with 3 five year bars also the Defence Medal 1939-45 and some 30 years ago was made a Life Governor of the National Fire Brigade Widows and Orphans Fund. 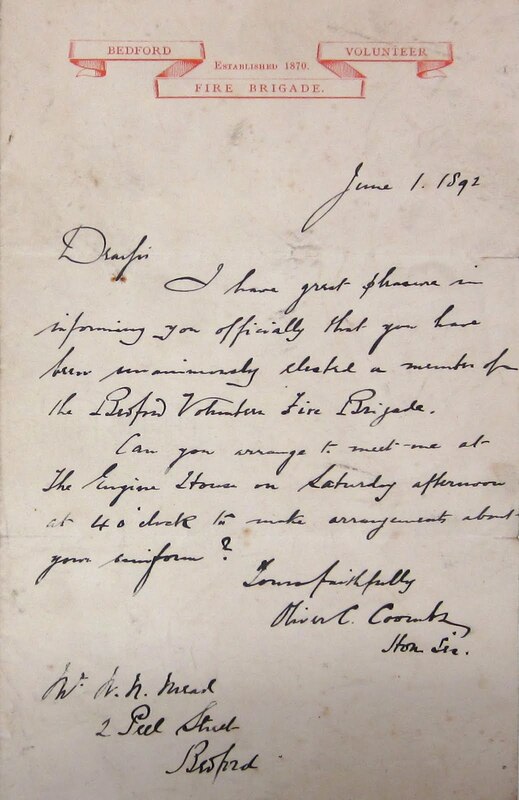 Not long before the end of his career in July 1926 a letter is written from Francis Corby, The Chief Officer, informing Mr Mead that he will be left in charge of the Brigade while he is away in Blackpool for a week. 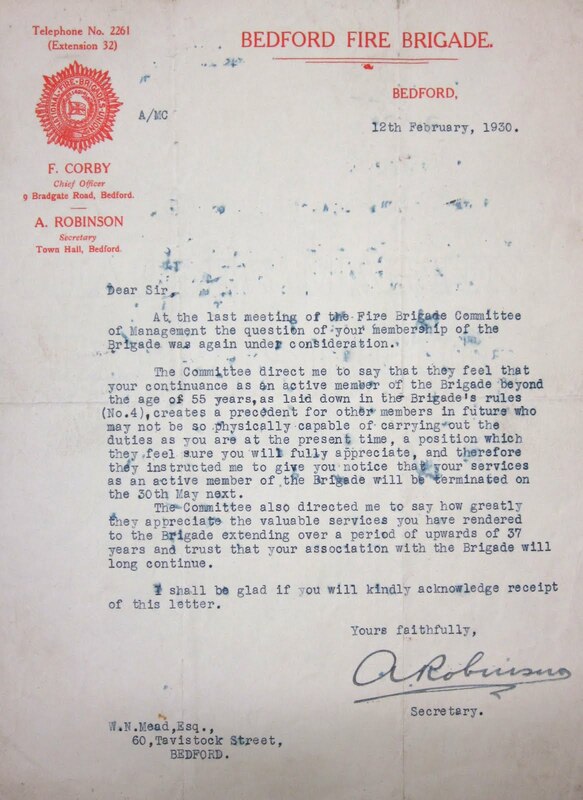 He comments "I have full confidence in leaving you in charge and am not going to give you any instructions but would remind you that you can call on Messrs W. H. Allen's men and also Peak Frean's if you require them, and also in case of a really big fire do not hesitate in sending for outside help". Both the Allens factory and the Peak Frean, also known as Meltis, Factory had their own private fire brigades in the event of a fire on site. 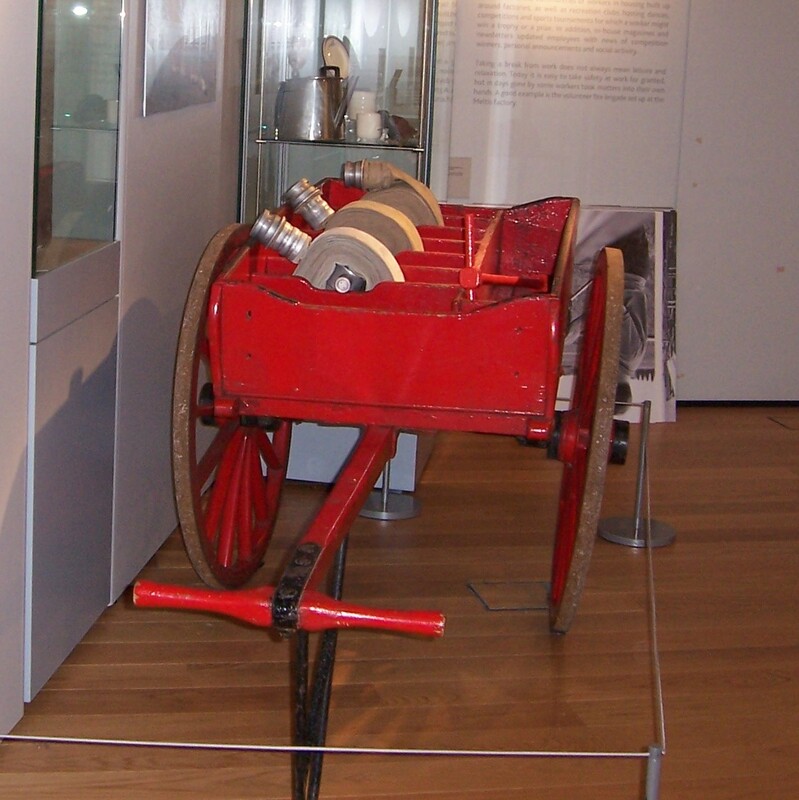 Meltis Factory Fire Brigade Cart, part of Bedford Museum's collection. his active service at Bedford Fire Brigade. 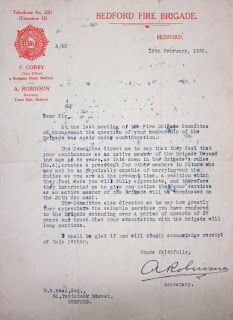 It would appear that because Mr Mead was a highly valued member of the brigade he was allowed some grace over his retirement age, which was 55 years in 1926 and Mr Mead appears to have been allowed to continue until 1930 when a letter from the Committee was written with concern over the precedent being set for other members of the brigade in extending his service any longer with the brigade. Shortly following his retirement the Recreation Committee wrote to Mr Mead offering him an Honorary membership to the Recreation Room and he is also elected an honorary member of the Brigade allowing him to continue some involvement with his colleagues. He appears to have been recalled during the Second World War to operate as the Liason Officer for the fire service at a time when every person counted for Civil Defence service with so many younger men now in the forces, and certainly an experienced fireman like Walter would have been invaluable with the threat of during the Blitz. 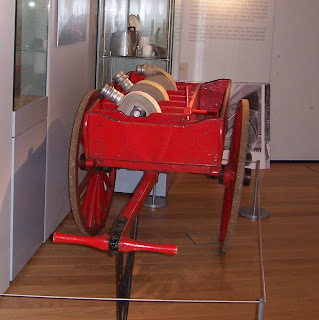 to assist with fire incidents during World War Two. Thank you to Mr Cole and Mr Lazenby for the contribution of the objects and letters donated to Bedford Museum collection. Thank you to Bedfordshire and Luton Archive and Records Service (BLARS) for the original photograph of Mr Mead.